What is a book? It is a thing. “Well, yes . . .” a student might say. Yet the status of “thing” is where I am learning to let this important classroom conversation linger. Many of my colleagues kick off a semester with the deceptively similar question, “What is literature?” The resulting chicken-or-egg discussions about the cultural functions of art build an essential foundation for undergraduates studying humanities. However, when I ask, “what is a book?” I often get partly digested, library poster answers to the literature question: books give us wings, literacy is the foundation of society, and so on. They imply that the book itself – spined cover, ink on sewn paper – is simply a vessel for literature. The husk around ideas. Amber preserving thoughts. Some will speak of a book’s aesthetic loveliness: the scent of old leather, the delicious diminishment of deckle edges. But if books contain art and can be art, they are also historical evidence. Books are items with provenance, their very existence influenced by economies, artistic conventions, and prejudices. They are artifacts. Survivors. Such radical reductivism at the beginning of a class lays the groundwork for my true intention, which of course is not to teach material culture at the expense of literary criticism, but rather to help students think critically about how the very subjectivity of literature – the fact that it is always immersed in a complex set of causes and effects – enables a type of analysis possessed of both reassuringly concrete logic and the fun of creative speculation. Service-learning Rhetoric and Composition II students Virginia Mayo and Heather Hofmann deliver valentines for the elderly. Likenesses reproduced with permission. When I began teaching literature, I encountered what at first seemed like a catch-22: many students lacked close reading skills, but close reading skills generally develop as students perceive intertextual and historical connections. How, in fourteen weeks, was I to foster allusive thinking among people who last read for pleasure in middle school? The answer drew on one of my most deeply held beliefs: that humans are creatures of story. Biblical allusions and retold myths may be lost on non-readers, but I believe every moviegoing mind in Western civilization is embedded with quest narratives and Freytag’s pyramid. Superimpose the popular plots of Star Wars, Harry Potter, and Lord of the Rings, tell the class about Joseph Campbell, and students reach the delightful discovery that they already own many of the tools they need. Awakened to familiar conventions and armed with new ones, my pupils can then develop an internal barometer honed to those changes in tone that indicate allusion, foreshadowing, or some other moment of textual significance. Among my greatest satisfactions is hearing an undergraduate say, “I don’t know what this passage is doing, but it is clearly doing something.” That student is on the way. Once they have developed that ability to read expectantly, my students easily adopt the research toolkit required to interpret a work within both literary conventions and cultural context. Exhibit A in my classes that touch on the Victorian period is often a serial novel from a local or online archive. Compare those brittle paperbound stacks to sturdy calf-skin incunabula and you have a clear picture of a dramatic change in information culture. Compare them to a leather-bound triple-decker and you have a notion of what canonization actually looks like. Of course considering the history of the book works best when tied to a more holistic interdisciplinary approach. Lacing up a student in a corset from my university’s costume archive gives the entire class a clearer picture of why Jane Eyre fainted on the moors, and more significantly, how it may have felt to be a nineteenth-century woman writer. This, in turn, provides entrée for discussions on the stakes of contemporary criticism and the status of the canon. Likewise, asking students to present on galvanism experiments while studying Frankenstein reminds us all of the nearly limitless horizons – and strikingly familiar ethical dilemmas – of what Richard Holmes calls the Age of Wonder. The science students in my general education courses are always happy to help parse the etymology of “analyze”: to break (-lyze) throughout (ana-). Yet non-majors often lament that, “English is hard for me because it is subjective.” This anxiety often transforms into relief when they realize that I will help them develop practical skills for working within subjective fields. Conversely, the starry-eyed bookworms benefit from learning to consider literature outside of the false category of objective Art. One could say that my introductory-level literature courses at Lee recapitulate the evolution of literary theory over the past fifty years. We begin with a Formalist approach that helps students develop close reading skills, progress through a New Historicist’s attention to context and material culture, and dwell for awhile in Reader-Response questions of how literature means. The semester then concludes in the postmodern age by considering how a polyphony of critical modes – feminist, multicultural, children’s studies, etc. – can inform perspectives on both perennial questions of social existence and our understanding of what it means to be a reader. 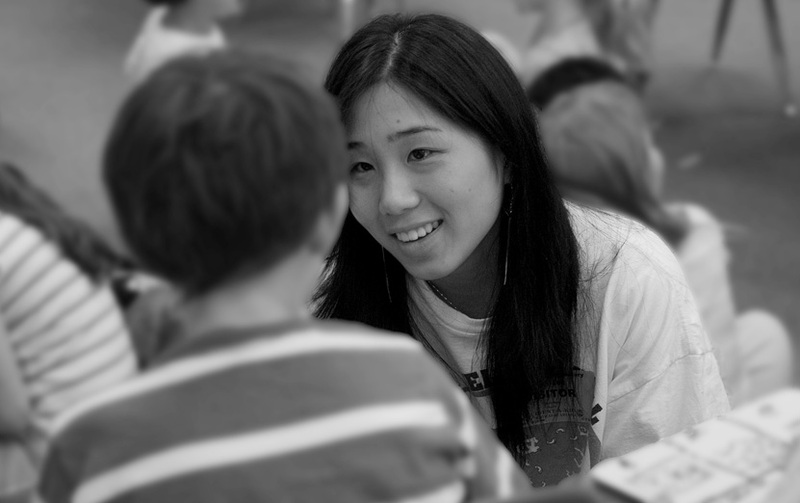 Service-learning Rhetoric and Composition II student Cindi Lee tutors at an elementary school. Likeness reproduced with permission. Just as the literature sections I design consistently reflect a commitment to developing interdisciplinary thinking, my composition courses require students to situate their writing within an extra-literary field of study. Since many English majors test out of composition, my students are almost always non-majors. In my service-learning composition course, I select community partnerships that relate to a variety of fields outside of English. This engages the students’ interests and helps them learn to write within whatever major they end up choosing. For example, in the past students have approached research at assisted living centers from medical, pharmaceutical, legal, and social work standpoints, and students working with schoolchildren have used their experiences to explore pedagogy, psychology, or governmental education policy. To understand how this works within an individual assignment, take for example two manifestations of the ENGL 102 quantitative research project I taught at UNC-CH. Members of the group working with the organization Solidarity with Palestine through Education and Action at Carolina (SPEAC) conducted a sociological survey of college students’ perceptions of Islamic cultures. By contrast, their classmates used Carol Woods Retirement Community’s archives as a data set from which to conduct a case study of the demographics of assisted living. Though the research approaches of these groups differed somewhat, both groups learned to write within the conventions of scientific reporting that I taught during that unit. This set us up to talk about objective versus subjective content as we moved on to the personal essay unit that followed. Universities are sometimes criticized for neglecting practice in favor of theory, so I use service-learning and other project-based courses to enable students to work in a given field and then to return to the classroom to discuss how their practical experiences stack up to their library research. In a writing course, this means that students develop broader writing and research skills in tandem with discovering richer things to say. Committing to project-based instruction as a means to balance theory with practice also holds me accountable to create relevant assignments and then talk with students about how these tasks relate to the kind of writing they might find themselves doing after college. Suddenly their efforts do not just result in hypothetical products seen only by their instructor, but rather in something real. “Relevance” is a buzzword, but at its core is a laudable intent to make connections between people, fields, and eras. My dissertation advisor’s most useful refrain in critiquing my own research was “So what?” She constantly reminded me that simply pointing out something interesting is insufficient if one fails to link it to relevant argumentation and a clear sense of context. The same is true with teaching, I’ve discovered. Teaching is not a magic trick to work on a passive audience as if one were the Wizard of Oz behind his curtain. Rather, I draw on contextual thinking to make the machinery and goals of the learning process as transparent as possible so that our classroom connections can grow organically. If students understand the pedagogical value of service-learning, decentered instruction, or interdisciplinary approaches to literature, they are more able to make the connections that ensure a lasting and meaningful education. For a comprehensive survey of my scholarship and teaching, please click here.